Understand the role each type (consumer, producer, decomposer) of creature plays in the carbon cycle. 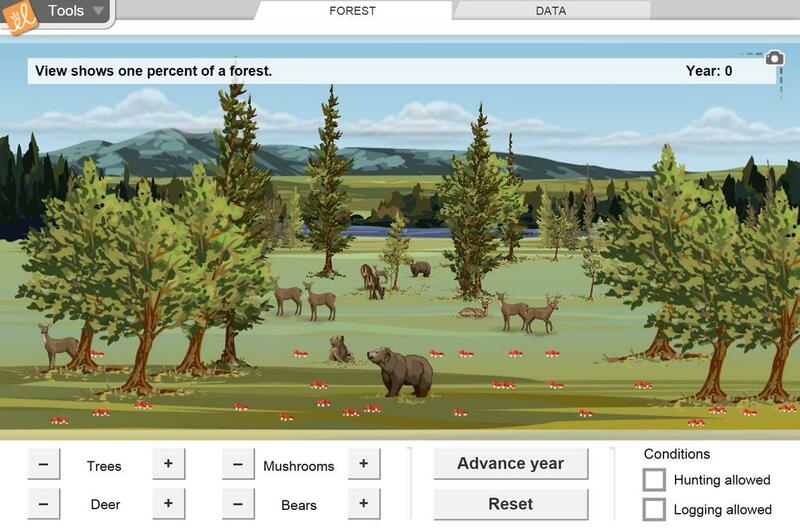 Determine the feeding dependencies in a forest ecosystem. Determine which consumers are decomposers. Interpret pictographs and line graphs. This CER worksheet asks students to write a proposal to allow hunting in this forest, while keeping deer ... (more)populations at a level of 50%. They will support their proposal with evidence and reasoning in order to convince the State Department of Natural Resources committee to select their proposal. This document is the French translation of the Assessment Questions of Forest Ecosystem. This translatio... (more)n was graciously provided by the Consortium provincial francophone de l'Alberta. This document is the French translation of the Student Exploration Guide for Forest Ecosystem. This tran... (more)slation was graciously provided by the Consortium provincial francophone de l'Alberta. I modified the lesson by simplifying it and deleting activities to make the lesson shorter and more kid f... (more)riendly. Great interactions. Good visuals, especially for students who may be more 'city' than rural. Check out the Pre-Gizmo activity Modeling Ecosystem Roles in the Teacher Guide under Lesson Materials. I highly recommend!